Butternut squash has quickly become one of the most adored and quintessential Autumn favorites on menus and kitchen tables alike. The first time I really ever had butternut squash that I loved, the squash was cut into bite-sized pieces and roasted to a slight crisp, spiced and salty and sweet all at the same time. Though I have since diversified my spice blends, integrating warming cinnamon and nutmeg with honey, I always return to this same recipe. My work schedule is quite hectic. With four jobs, I don’t always have time to completely think my lunches through. On the days when I work from the office, my lunch is usually quickly thrown together with mixed greens and various toppings… Hopefully the combination forms a salad that will sound as appealing at lunch time as it did when I was sleepily and haphazardly putting it together! One day in particular, I combined pomegranate seeds, roasted butternut squash, and a balsamic vinaigrette. Lunchtime was disappointing that day, as I was left thinking of all the things I could have added to the salad to make it even better… I was determined to try again. The next day I got it right. This salad has everything; the apple balsamic vinaigrette contributes a rich tang alongside crunchy pomegranate seeds and fresh apple, which both add to the sweetness that is achieved with the butternut squash. Spicy chicken sausage, feta cheese and crunchy pecans and walnuts put the final touches on this gorgeous Autumn salad. I can see this salad as an individual lunch, as pictured here, or as a starter salad to your next dinner party or Thanksgiving gathering. Cut the squash in half lengthwise, scoop out the seeds. You can reserve the seeds to roast them (like pumpkin seeds, but smaller and way cuter) if you want to- I usually do. Rinse and reserve seeds. To roast, sprinkle with salt and spread on a tinfoil-lined baking sheet. Roast for about 12 minutes, until crisp, tossing once halfway through the cooking time. Sprinkle all of the spices on the squash and toss to coat. Grease a cookie sheet with 1/2 tbsp melted coconut oil and spread butternut squash cubes evenly (you will probably need 2 baking sheets). Drizzle 1-1 1/2 tsp melted coconut oil evenly over the butternut squash. Bake at 375 degrees F for about 25-35 minutes, tossing half way through. The squash is done when it is tender and the edges are slightly crispy. Combine apple butter, balsamic vinegar, olive oil and pepper in a small container. You can also add thyme or rosemary if you would like. Seal tightly and shake vigorously to combine. Set aside. Wash greens and apple. Cut apple into bite-sized pieces and add to the greens in a salad bowl. Add the pomegranate seeds, sausage, nuts and feta. Toss with vinaigrette and enjoy! I hope that you are all as excited for Thanksgiving as I am!! Tell me, what is your favorite Autumn salad? I have seen some very innovative ones lately! Each year, Thanksgiving is an important event with my family. We always have extended family come in town for the weekend and it is such a fun time with everyone spending time together, cooking and laughing. I may have mentioned before that we typically make many of the same dishes each year. There is something extraordinarily comforting in that; our dishes represent home, family, compassion, and love. The most anticipated of all (besides the smoked turkey) is our Derby Pie. The recipe is a traditional dish from Kentucky, where my family is from. 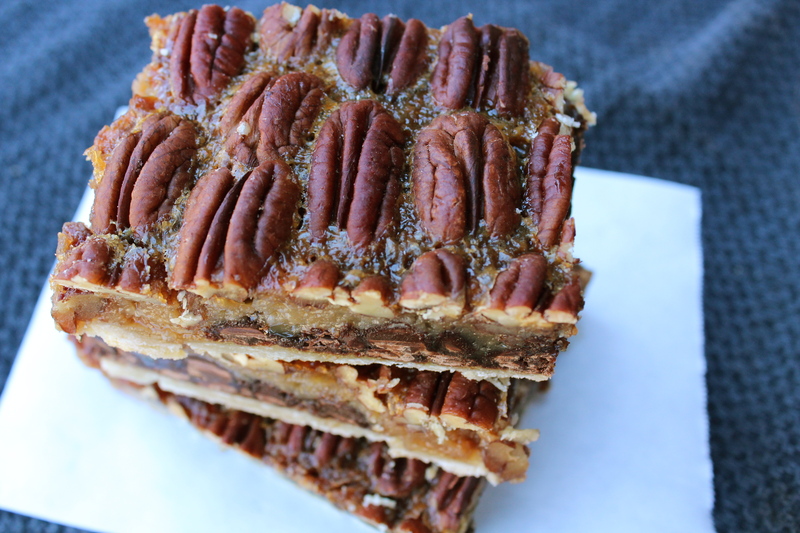 It is very similar to a pecan pie, and they always disappear faster than anything else on Thanksgiving Day. For the crust I used my Great Grandmother’s dough recipe, which has become my go-to for baking. You can find that recipe here. Preheat oven to 350 degrees. 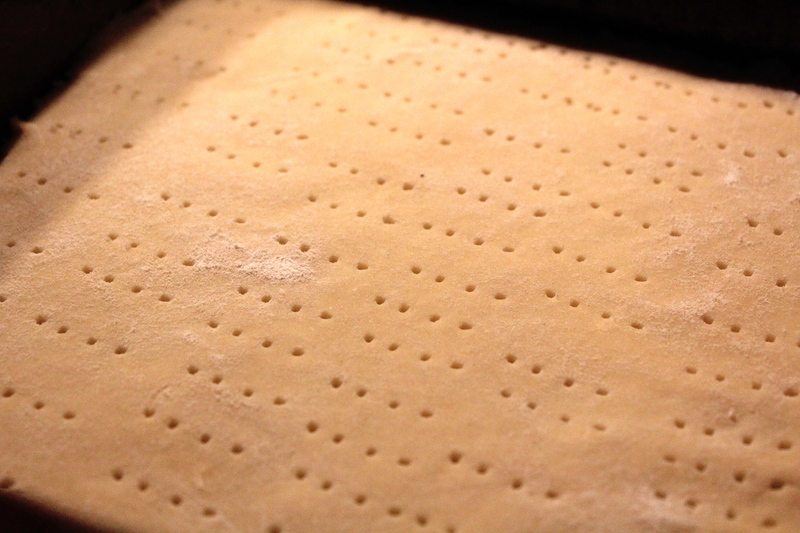 Roll out dough and cut to fit the bottom of a square baking pan. Grease the pan and carefully place the dough inside. Prick all over the dough with a fork and bake for 20 minutes, until just golden. While the crust is baking, prepare the filling: In a small sauce pan combine butter, brown sugar, and corn syrup. Bring to a soft boil and stir occasionally for 8 minutes. Meanwhile, pick all of the “pretty,” in-tact pecan halves out and crush (or chop) the rest of the pecans. Remove the pot from heat and add the vanilla and bourbon. Stir to combine and add 3/4 cup crushed pecans and salt. Set aside to cool for 10 minutes. Once slightly cooled, slowly whisk eggs into the filling. Remove the crust from oven. Add the chocolate chips and then pour the filling mixture on top. 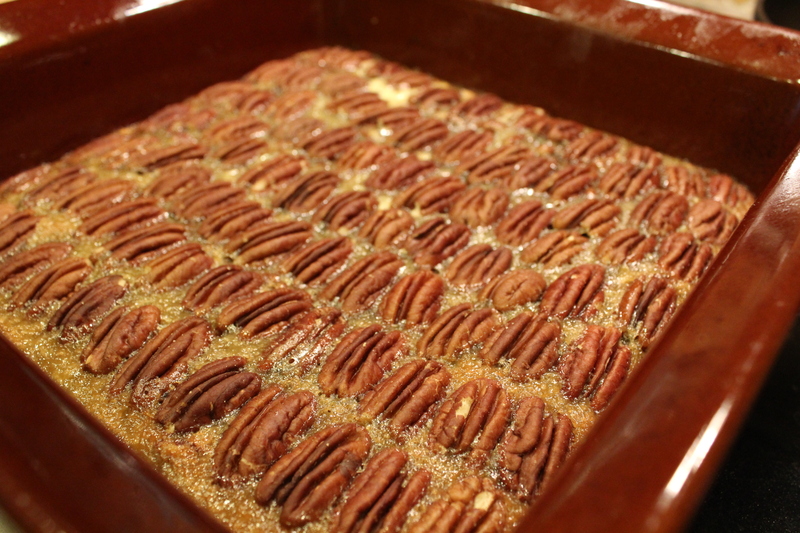 Carefully lay the pecans in lines (or whatever fancy design you like) on top of the filling. Return to the oven and bake 35-45 minutes, until the filling seems to have set; it will not feel too squishy to touch. 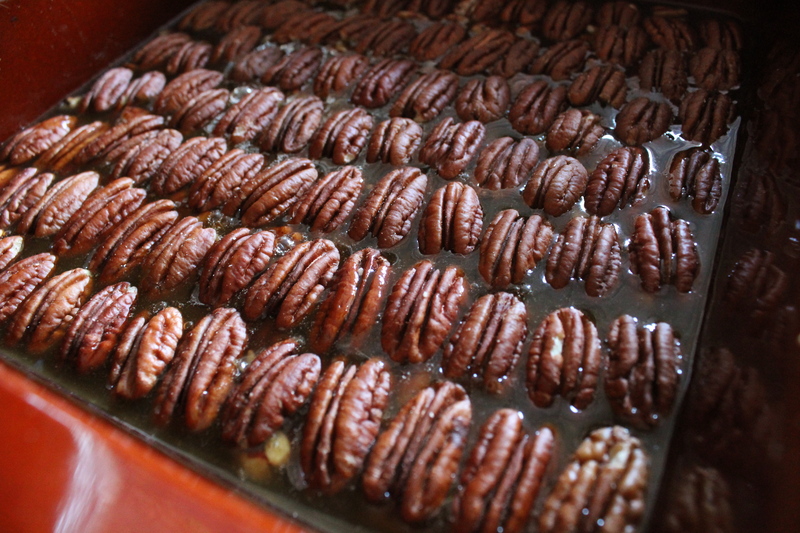 If the pecans begin to brown too quickly, cover the pan lightly with foil. 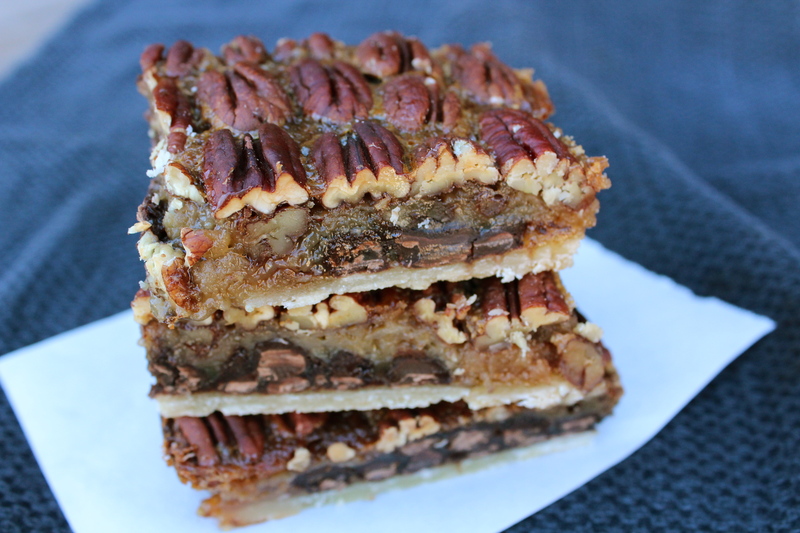 I hope you find time to make these for your family during this holiday season, they’re divine. Share them with too many people & they’ll be requested by name! *I realize that some people are adverse to corn syrup. I am too, but I wanted to stay as true to my family’s tradition as possible with this recipe. If you prefer to not use corn syrup, you can substitute honey for some of it and add more brown sugar. I did not try this method, so I cannot vouch for its flavor or consistency. My favorite time of the year is Autumn, with the promise of brisk mornings, crackling fires, and dinner parties. It means Thanksgiving is growing near, my favorite holiday spent among loved ones from near and far. I adore having the whole family together in the kitchen, sharing, laughing, cooking. I am so grateful that this year most of my Dad’s family can travel to Arizona to celebrate the holiday with us. My family typically enjoys many of the same Thanksgiving dishes every year, but we often like to shake it up a bit- especially with the appetizers. Sunset Magazine is our favorite source of inspiration, but we often draw insight from other origins as well, including restaurants and favorite dishes. One of my most favorite appetizers is the crostini. Similar to bruschetta in style, a crostini can don any topping, and the possibilities are endless. One of my favorite places in Phoenix has the best bruschetta with a myriad of toppings to choose from, and the most inspiring to me is their brie with apples and fig preserves. My family also adores it, so I decided to bring it home, into our kitchen, to share with our out of town guests. The idea behind this sweet and satisfying appetizer is simple, but the flavors are huge. It can be made for a festive dinner appetizer or as a weekday snack; either way it is equally special and delicious. These disappear very quickly in our home, especially with family and friends hanging around on the holidays. I hope that you and your loved ones enjoy just as much as we do! Preheat oven to 375 degrees. Slice baguette into 1/2 inch slices, brush with olive oil and place on a baking sheet. Toast in the oven, turning once, until lightly golden brown. Remove toasts from the oven and let cool. Thinly slice the apples and set aside. 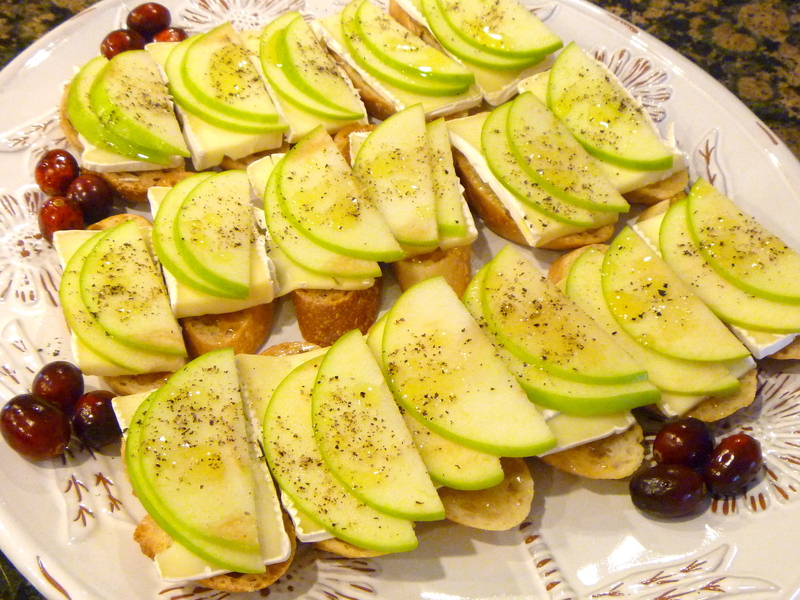 Slice the brie into pieces to fit each toast. 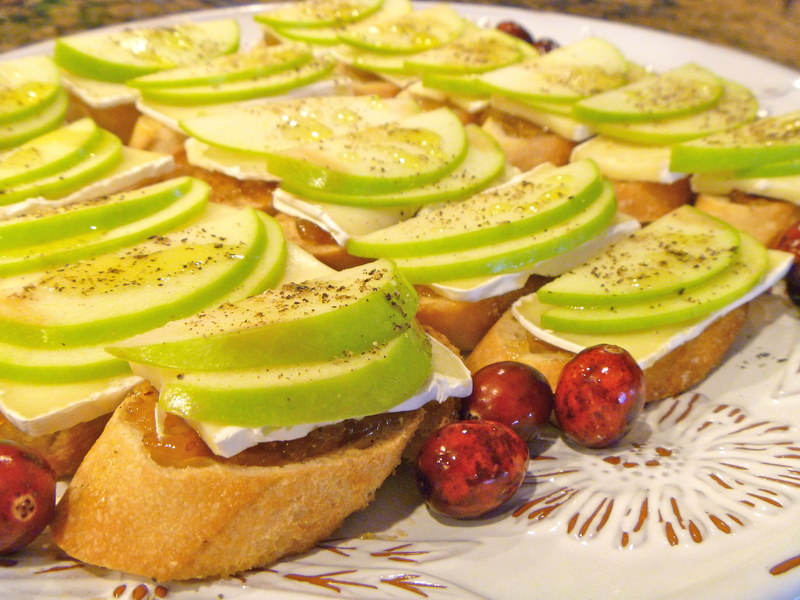 When the toasts have cooled enough to handle, spread each one with fig jam, layer on a slice or two of brie, and one to two slices of apple to cover. Drizzle each one with a small amount of olive oil, and finish with freshly cracked pepper. Enjoy! Expect more Autumn and Thanksgiving-inspired recipes to follow as the season and holiday approach us.